Neither the Weakness to Poison nor the Turn Undead enchantment on the bow have a duration, at any level. Therefore, neither effect actually works on the weapon. Undead enemies fail to flee, and since Weakness to Poison only works on all poisons used after the effect is introduced, there is no poisoned attack fast enough to take advantage of Shadowhunt's instantaneous enchantment. 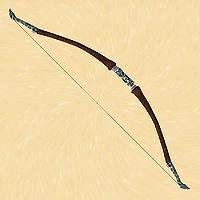 At high levels, the Turn Undead effect available from this bow is technically higher than any other available in the game. However, it is actually ineffective because of its zero duration (see previous note). Esta página foi modificada pela última vez à(s) 00h51min de 7 de junho de 2013.